From my Editor’s “Sorting Hat”… One thing I’ve noticed is that submitting authors have come to expect rejections. They accept rejection too easily. Even when they aren’t being rejected. Most new authors have no idea how the publishing system works. They are writers. So now what? I was fortunate to finally find answers to my questions, and to questions I hadn’t even thought of, with experienced authors at RWA and then at Tampa area Romance Authors, the local chapter I joined, where the wealth of information about the publishing process was invaluable. Gracious published authors like CL Wilson, Julie Leto, Karen Rose, Virginia Henley, Betina Krahn, Terri Garey, Roxanne St. Claire, Kresley Cole, and so many others, gave their time and experience to pull up promising authors. The information and advice they shared helped everyone. So when I encounter a new author who doesn’t really know how to format her manuscript, or write a submission letter, or know where to find advice, I recommend joining a professional group. In my case I did join a group of writers early on, but they were a mixed group. I write romance and was too embarrassed to read aloud during critique sessions. So without a critique partner I still learned plenty about writing from critiquing other people’s work. I am a reader, after all, and I know what I like and don’t like. Did it drag? Did it grab me right from the start? Did it confuse me? Did I stop reading it? Was the dialogue bad? Were the characters interesting, flawed or boring? So it didn’t take me long to begin looking at my own work with a discerning eye. I couldn’t seem to cut what I needed to cut. I wrote around passages that didn’t fit to keep them in because I liked the way the words sounded or the illusion they created. It slowed the pace, it didn’t move the story forward or show the reader anything about the characters. Even when I did find a patient soul or two to critique my work (I can’t believe they are still my friends after all this…) I didn’t want to change it. So where did the manuscript go? I submitted it and got rejections. No explanation of why. But in retrospect you know why, right? All my critique partners were right. I knew it. I just didn’t know how to fix it. There are plenty of wonderful editors and agents who look at your manuscript and want to publish it. They like you. They like your characters. They like the plot. But sometimes they don’t have the time to fix all the things your manuscript will need to make it a viable published book. If you get a rejection letter with suggestions…your manuscript may NOT have been rejected after all. Do NOT be afraid to ask if you can revise and resubmit. If you are lucky enough to get the okay to resubmit, do NOT rush through it and send it right back. I’d get everyone’s opinion who reads your genre to take a look before you send it back. I’d let it sit for a while after I addressed the obvious concerns. Time is the best judge of your work. If you go back to your book and are absorbed in the story and surprised and pleased with the dialogue and narrative when you reread it, fantastic. I can’t tell you how often I don’t remember writing certain passages, and I wonder who did. I was in a zone, and my muse had completely taken over. It was beyond good. Beyond what I believed I was capable of writing. And then there are the other times when I read a scene and wonder what the hell I was thinking. The sentences are a jumble of crap. I misspell words, misuse words, mix metaphors, write a scene out of point of view…ugh. You get the picture. Self edit. Gather all the information you can about the industry, the editors, the agents and agencies you want to submit to. If you get your manuscript in front of anyone make certain it will reflect the best you have to offer. If you get rejected, confirm whether you should revise and resubmit or whether your book is not a good fit for the publisher or editor. You want someone who loves your book as much as you do to manage it, agent, editor, or publisher. You want all hands on deck when it comes to producing your book. I have had to chase after authors who thought I’d rejected their books and explain I want them to fix what I pointed out. It isn’t hopeless. Sometimes, there’s too much story for the length, or not enough. Sometimes the clutter is hiding the magic. That can all be an easy fix. But sometimes it isn’t good for the publisher or the genre line. That may not be fixable. No one benefits if a reader isn’t looking at a publisher or distributor for your book because yours maybe mystery and the reader only reads paranormal. So make sure you are positioning your work well. I’ve probably forgotten to include a million other issues but I hope you get something out of this post. 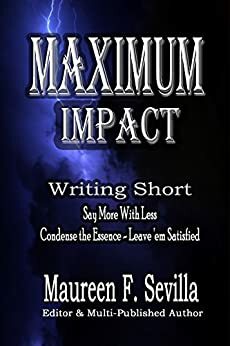 I’ve been editing for The Wild Rose Press for almost ten years under the pseudonym, Frances Sevilla and independently freelance editing as Maureen F. Sevilla. When I’m a writer, Eliza March, I am exactly like every other writer. I have a hard time seeing my books’the flaws.